East New York is officially the first neighborhood under de Blasio to be totally rezoned. Yesterday, the New York City Council approved the East New York Community Plan (ENYCP) by a 45-1 margin. Because the ENYCP abides by the mayor’s just-passed affordable housing and zoning initiatives, the eastern Brooklyn neighborhood is viewed by many as the first proving ground for the mayor’s ambitious reforms. The primary goals of the plan are to create more affordable housing and spur economic development. The ENYCP is part of Housing New York, the mayor’s initiative to build or preserve 200,000 units of affordable housing. ENYCP covers 190 blocks and is the first plan to apply Mandatory Inclusionary Housing (MIH), a suite of new zoning rules that require a certain percentage of new housing be designated as permanently affordable. 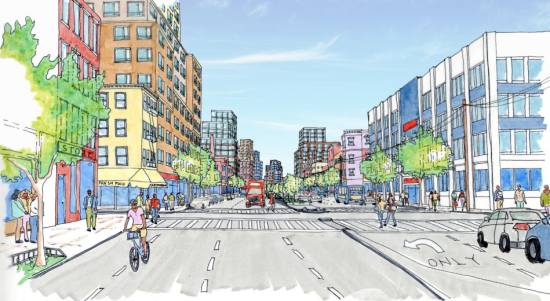 In East New York, however, affordability would go deeper than MIH minimum thresholds: NYC Department of Housing, Preservation and Development (HPD) says that any project it backs in the neighborhood will be entirely affordable. 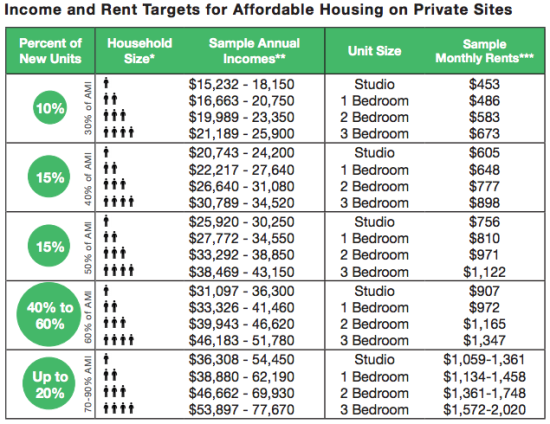 Units will be available to families making between 30 and 90 percent of the Area Median Income (AMI): $23,350 to $69,930 for a three-person household, respectively. 1,200 apartments will be constructed over the next two years, and HPD anticipates that more than half of the approximately 7,000 units developed in the neighborhood over the next decade will be permanently affordable. Lured by new housing, the city estimates that more than 19,000 new residents could move to the neighborhood in the next 15 years. The plan that sailed through the City Planning Commission, the penultimate approval body, in late February is slightly different than the one that the council passed. The council’s modifications added more protections for displacement of current residents, tenant protections from harassment, promises to secure housing for the homeless, and additional community services like job skills training. The city will also spend $267 million on infrastructure improvements, including a new park and school.